Mobile Wallet Market size estimated at USD 100 billion in 2017 and is anticipated to grow at a CAGR of more than 10% from 2018 to 2024. The increasing penetration of smartphones is driving the growth of the mobile wallet market. Over the past decade, a rapid surge in the adoption of smart devices have been witnessed. There were over 2.26 billion smartphones across the globe in 2017. It is estimated that by 2025, smartphones will account for over 77% internet-enabled devices. As the adoption of smartphones are increasing, the trend of using financial services on mobile devices is also gaining momentum owing to convenience and cost-effectiveness. This has encouraged financial establishments and technology players to cater to the growing demand for mobile applications to deliver payment services. The rise of various e-commerce platforms is also driving the growth of the mobile wallet market. As of 2018, over 1.5 billion customers shopped online. By 2020, the number of online customers is expected to reach over 2.5 billion. With the evolution of global e-commerce and an increase in internet coverage across the globe, the ways in which consumers pay for their goods have also evolved. Consumers want to buy things that they like from anywhere across the world in a fast, effective, and simple manner. This is promoting the use of mobile wallets across various e-commerce platforms. The semi-closed mobile wallet market was estimated to account for 80% of the revenue in 2017. This growth is attributed to the influx of multi-national tech giants in the fintech sector. Changing customer preferences are encouraging tech players to launch their own semi-closed mobile wallet product offerings. Over a third of millennials (population aged between 15 to 34) believe they will be able to live a bank-free existence in the future. These millennials are more tech-savvy and accustomed to digital platforms offered by various technology players. 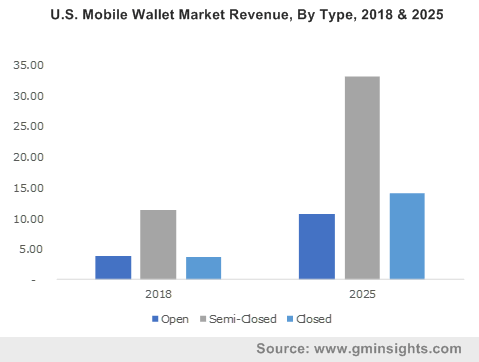 The closed mobile wallet market is estimated to grow at a CAGR of over 20% over the projected time period. Increasing investments by the e-commerce players to launch their own mobile wallets are promoting the use of closed mobile wallets. E-commerce players as building their own closed mobile wallets to enhance customer loyalty and promote repeated purchases. E-commerce vendors are providing various lucrative cashback and discounts that incentivize customers to store money in their mobile wallets. Tech companies held more than 80% shares of the mobile wallet market in 2017. Technology players such as Uber, Ola, Flipkart, MakeMyTrip, and Amazon are focusing on investing in mobile wallets to provide integrated banking experiences to their customers. Companies are leveraging on their technological background to provide innovative product offerings to their users. The favorable regulatory environment is also encouraging technology vendors to launch their own mobile wallets. The device manufacturer segment is predicted to grow at a CAGR of over 20% over the projected timeframe. Smart devices are becoming primary devices in the daily lives of users for purchasing goods & services. This is encouraging device manufacturers including Apple and Samsung to introduce their mobile wallets for capitalizing on growth opportunities. 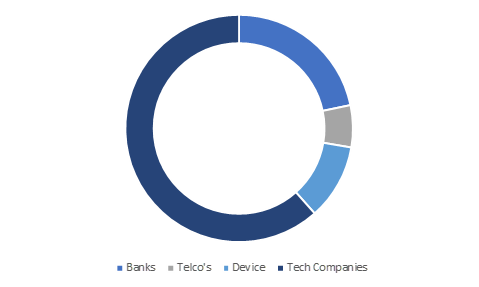 Moreover, the rising penetration of smartphones and other smart devices provides companies with an effective distribution network to deliver their mobile wallet solutions to device owners. The NFC market is estimated to account for over 70% of the total revenue in the mobile wallet market. The NFC technology has been adopted across several industries from retail to hospitality. This encouraged mobile wallet providers to integrate the NFC technology in their mobile wallet solutions. In addition, the technology is available in most smart devices in the market, which is further promoting the use of this technology in mobile wallets. 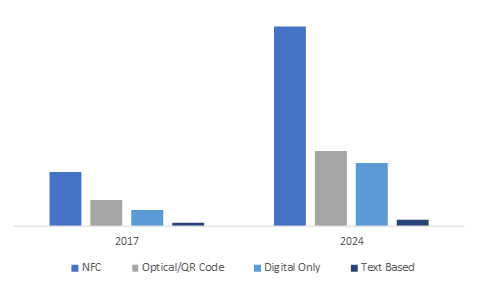 The optical/QR code segment is projected to grow at a CAGR of 6% over the forecast timespan. The cost-effectiveness of mobile wallets is promoting the use of the Optical/QR code technology in mobile wallets. Merchants around the world are adopting Optical/QR-code-based mobile wallets as it does not incur any additional expenses. Particularly, in the countries, such as India and China, where the merchants do not own Point of Sale (POS) system QR code-based mobile wallets have received widespread acceptance. Asia Pacific dominated the mobile wallet market landscape with a 90% share of the total market in 2017. The market is driven by a rising number of e-commerce platforms including Flipkart and Alibaba. Favorable government initiatives to promote the use of digital payment channels are also driving the growth of the market. The explosion in a number of smartphone owners and the technological advancements in connectivity infrastructure is also encouraging the use of mobile wallets in the region. The North America mobile wallet market will grow at a CAGR of 15% over the projected timeline. Changing customer preferences are driving financial & commercial establishments to adopt various mobile banking solutions. Flurry mobile wallets introduction by various retail players, such as Starbucks and Dunkin Donuts, to gain customer loyalty, which is further endorsing the use of mobile wallets in the region. The mobile wallet market is led by major players in the Asia Pacific region including WeChat and Alipay. These vendors are forming partnerships with various merchants to increase the usage of their mobile wallet offerings. Device manufacturers and banking establishments, such as Chase Pay and Apple, are providing lucrative offers to increase the use of their mobile wallets across various e-commerce platforms & merchants. They are also strategically acquiring of various mobile technology providers to enhance its product capabilities. For instance, in December 2017, JP Morgan Chase acquired WePay, a fintech start-up to integrate its API solution that can handle payment processing, fraud detection, and complex payouts in its product offerings. 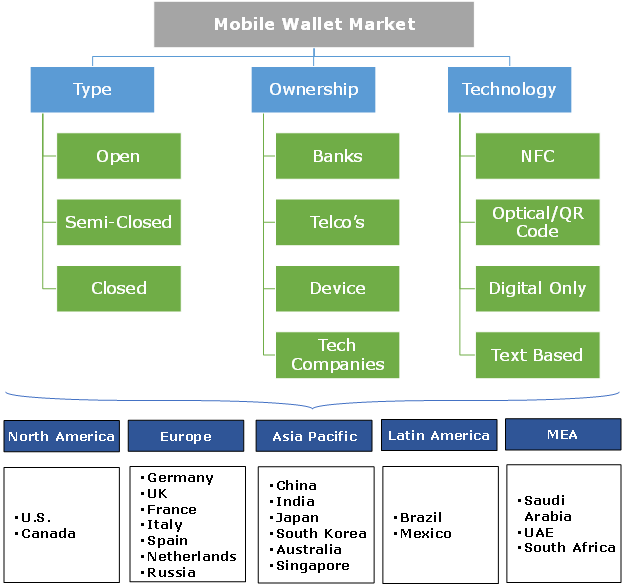 Some of the key players operating in the mobile wallet market include Apple, PayPal, Samsung, JP Morgan Chase, Amazon, Tencent, Google, Ant Financial, One97 Communications Limited, Vodafone, Skrill, American Express, Sprint Corporation, Well Fargo, Mastercard, Visa, First Data, and AT&T. Over the years, commerce is being increasingly conducted through mobile devices. Smartphones have become dominant internet access devices across the globe, replacing laptops and desktops. With every new smartphone user, the interconnectivity through various mobile wallets, such as Paytm and Apple Pay, increases exponentially as it is changing the very fabric of the banking industry. Banks across the globe are exploring ways to convert to a more digital business model. Modern customers are placing more importance on the digital banking capabilities of their financial institutions. This has forced traditional banks to develop their own mobile wallets and adjust their digital strategies to keep up with their competitors.